Did Pre-Raphaelite Women Wear Chunky Knits? First, I would like to say my thoughts have been straying across to the East Coast of America. I really hope you are all safe and well. So here I am turning my back on browns, reds, oranges, purples, and germs and embracing a little greenery. 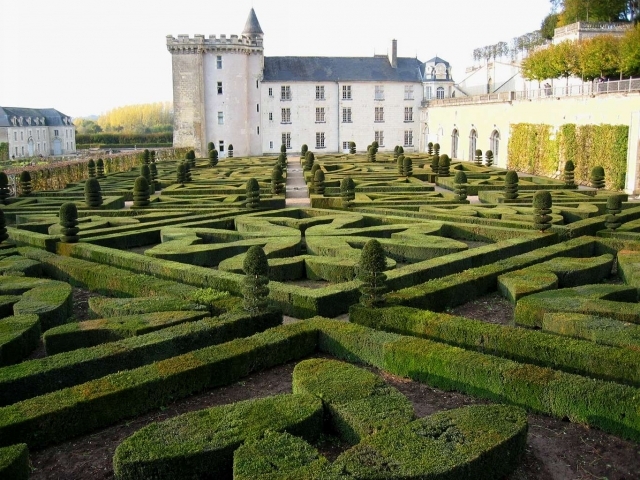 ﻿During the entire month of October I nursed the hope of visiting the gardens of Villandry again to admire the pumpkins growing higgledy piggledy in the potager against the magnificent backdrop of vivid green boxtree broderies before this château closed its gates for winter. However endlessly rainy weekends and cherished visitors from afar thwarted my plans so here instead is a picture of the ornamental gardens at Villandry taken last spring to nourish my love of vegetation. Rainy Sundays inspired me to pick up my knitting needles and make something for my eldest daughter. Half the fun of knitting for her is choosing the colour together and three cheers for Héloïse; she chose GREEN! Here is Melissa LaBarre's Agnes which I have renamed "Boxtree". I could have called it "In The Blink Of An Eye" for I swear this is the most ridiculously rapid knit ever! I am not very fond of chunky knits and mostly prefer knitting with fine yarns however this pattern has seduced me to the non-negligible charms of fast knitting together with the delights of Quince & Co. Puffin yarn. Here are my Ravelry notes in case you are interested. Don't you think that colour suits Héloïse? That hair makes me think of a Pre-Raphaelite woman. I'm getting quite excited at the thought of finding some knitting patterns which would suit this Pre-Raphaelite look of hers. Any ideas? Like all mothers I am proud of my daughter. She is strong, thoughtful, bright as a button, and stoic. It is not always easy to be the eldest of three but I am grateful to her for being supportive and patient. We try to carve some precious time out to spend together for I cannot help but see the moment looming on the horizon when she will spread her wings and fly away. I cherish our brainstorming sessions for she is very creative despite her school's desire to push her into a scientific profession. Do you remember, about a month ago, I wrote about an audition at the regional academy of music and theatre? After three intensive days Héloïse was accepted alongside eleven other candidates, aged between twenty and twenty-six. There had been fifty two would-be actors auditioning. Of course Héloïse was thrilled but her hopes were slightly dashed when she found out the five-hour weekly classes were scheduled on wednesday afternoons: a time when most secondary schools do not have lessons here in France. Héloïse's school, unfortunately, is an exception to this rule. The academy teaching staff were sweetly disappointed and urged her to drop in and participate whenever she had a spare moment. They also reassured her that a place would be kept for her in the future. In the meantime I must return to browns, feeding my merry band of artists, and slowly preparing for our departure on Friday. I am nursing myself back to health with all manner of herbal infusions and teas. My favourite at the moment is Mariage Frères Chandrenagor black tea.mixed with cloves, ginger, cinnamon, cardamom, and black pepper. It really is heavenly with a spoonful of brown sugar. Which begs the question: which tea are you drinking today? Keep well and happy end of week to you all. I am dedicating this post to my remarkable father who turns ninety today. He is a lover of wood and a talented carpenter in his spare time. The Box and Fir to talk begin! That in the Flute distinctly speaks!" Adapted to music by Henry Purcell in his Ode to St. Cecilia in 1692. To be listened to and marvelled over here). 1., 2. and 3. French early eighteenth-century 'Baroque' oboe. Referred to as E108. The original was made of ebony and ivory with silver keys. Mine is made by Olivier Cottet from ebony and rosewood. Click here if you would like to here an extract of this instrument being played by my teacher, Elsa Frank. 4. and 5. The tools required to make an oboe reed. One of the challenges of learning this instrument is having to make one's own reed as there are none available for purchase. Tricky? Oh, yes! The reed on the left was my first attempt. (Don't be fooled; it looks alright but the quality of sound was just not good enough.) An eighteenth-century oboe only has two keys so to reach the higher notes the reed, which is more supple than a modern oboe's, must be blown harder which makes for very achy cheek muscles! 6. and 7. 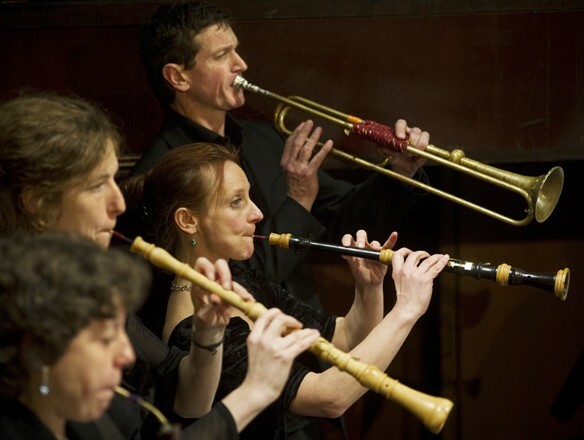 An example of the exquisite music to be played on the Baroque oboe. Anne Danican Philidor (1681-1728), composed sublime music, heavily ornamented to show off the player's virtuosity. Do you see all those crosses on the score? Each one represents a different ornament. The bass clef is for the harpsichord accompaniment. The numbers refer to the chords to be played. The idea, put into words by NIcholas Brady, of trees finding their voices is a charming one. Instrument makers put so much love into the wood they chisel and carve so that musicians may cherish the instruments they play. Some believe that trees speak to one another in the woodlands too. I would very much like to know what they murmur to each other during autumn as their leaves turn into a symphony of colours and fall silently to the mossy ground. Are they sad or joyful? To celebrate this bitter sweet moment I have made Mademoiselle Autumn Serenade, possibly my last autumn hare this year. 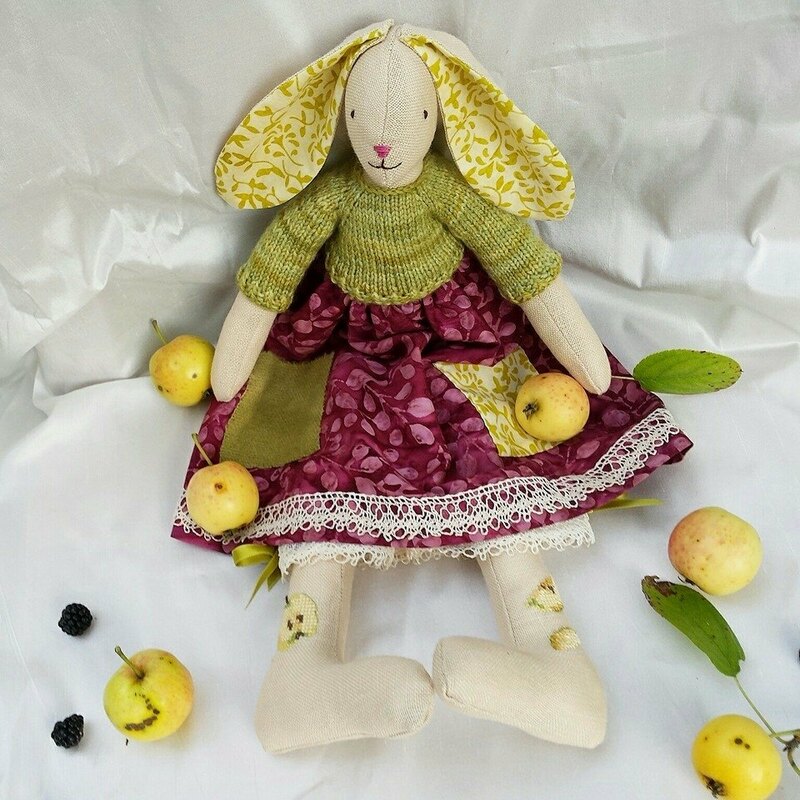 This little lady is a lucky hare for she has been stitched from hand-dyed linen (R & R Reproductions for those who like to embroider with soft, natural coloured linens), hand-dyed felted wool, purchased from this lady, and embroidered with silk thread in glorious, hand-dyed autumnal colours. Her crowning glory is the handmade lace which has been lovingly prepared by a friend of mine for her. Somehow that creamy lace on the dark tweed trousers reminds me of the ivory and ebony wood on my oboe; do you agree? Mademoiselle Autumn Serenade, with her embroidered leaves gracing both ankle and ear, is a quiet soul who loves to wander through the countryside and forests gazing up at the trees and the autumn leaves drifting silently to the ground. If the wind is blowing too hard she likes to retreat indoors to sit by the fire, sipping spicy tea and listening to classical music. She is not much of a chatterer but she does like singing quietly to herself, perhaps a little Henry Purcell? If she were your hare which music would she be singing, I wonder? If one of you might like to give a home to her you will find her here. And now I must prepare the decorations for my father's birthday celebration to be held in Tunbridge Wells the first weekend of November. November? Where did this year go? I wish you all a tranquil and happy week. I will be back very soon as I have some pictures of Héloïse I cannot resist showing you! Edited Tuesday morning: Mademoiselle Autumn Serenade is off to start a new chapter in her long-eared life. Farewell! "Man was caught between truth and illusion; life, perhaps, was merely a dream and the world was like a theatre which would split itself into many parts and the mask would become a face; a double-sided face which revealed the existence of opposites and man's constantly changing nature." Now that autumn is well and truly here I find myself retreating back into my imagination more and more. Ideas are dancing around my head and strange characters inhabit my sleep. It's all good although a balance needs to be struck as ever with real life. 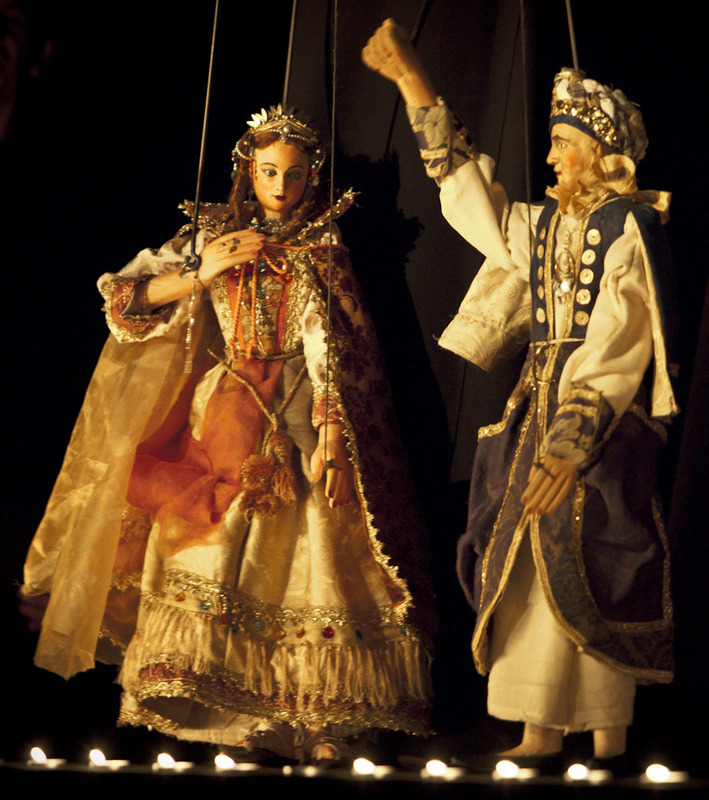 For a few years now I have been quite fascinated by seventeenth-century performing arts and the term Baroque. It's a difficult concept to pin down but that, I believe, is part of its charms. Elaborate, excessive, inconstancy, and make-believe are but a few defintions all sharply contrasted to sober rationality. To understand the Baroque world is to enter a place where appearances are deceptive and the trompe-l'oeil becomes reality. I love it but only as long as it remains distinct from my real world, you see. 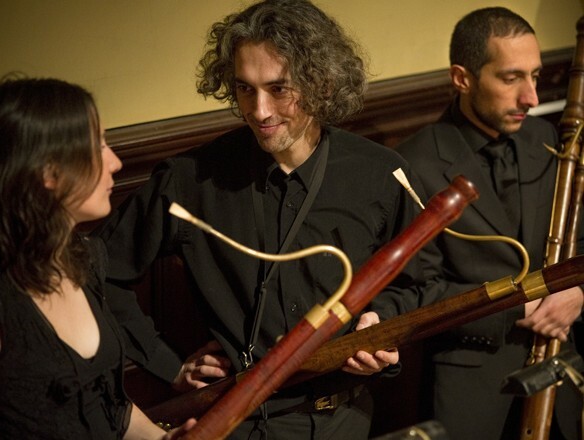 When living in Normandy I had the good fortune to learn how to play the Baroque oboe with Jérémie Papasergio and his wife Elsa Frank (seen here in central place brandishing a baroque oboe). Through these years of aching face muscles and dizzy spells (it is a very, very hard instrument to play: more on that at a later date, Sue and Annie) I struck up a friendship with this remarkable couple who, in turn, introduced me to a fascinating world of Baroque specialists. The two pictures above are taken from the Baroque company Le Poème harmonique directed by the extremely dishy talented Vincent Dumestre. 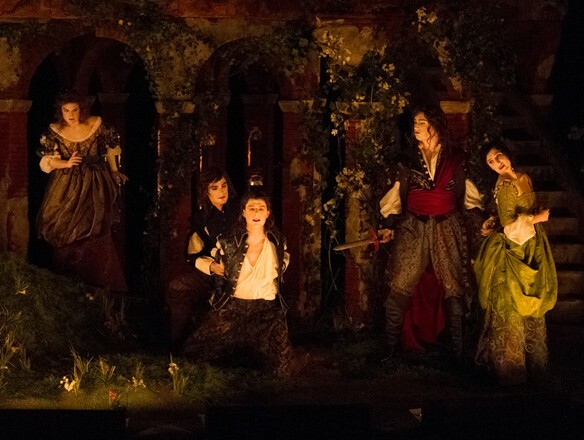 Jémémie and Elsa regularly performed in Vincent's Baroque operas (as seen in the two pictures below) and, well, Héloïse and I had the good fortune to attend a few dress rehearsals at the Opéra Comique in Paris. Whilst researching Baroque costumes this week I was particularly interested in a 1977 costume created for Jean-Philippe Rameau's opera Platée which was designed by Beni Montrésor (1926 - 2001). 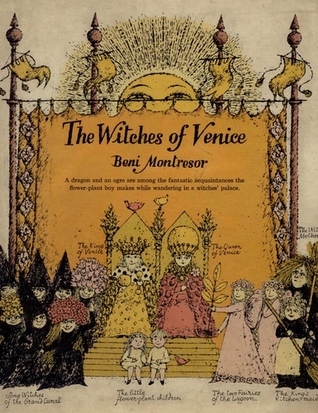 Unfortunately I cannot reveal this costume to you today but, in true Baroque style, I fell into the enchanting , multifaceted world of Montrésor's children's book illustrations. 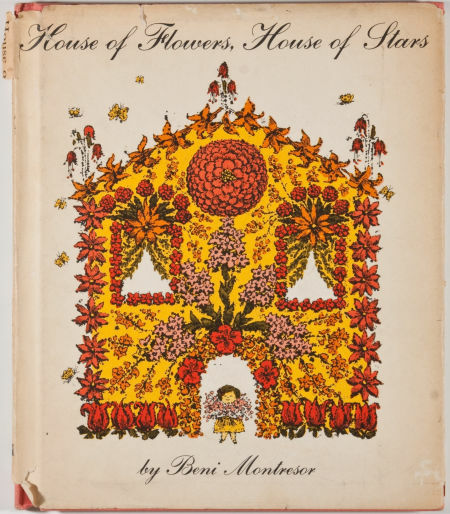 There are many of Beni Montrésor's books available secondhand. I urge you to take a look here; you will be both charmed and inspired by his artwork, I believe. Finally, as we stepped out this morning, my husband and I, to take a few pictures of my first autumnal hare, I could not help but notice as the sky turned from lead to blue and the surrounding vegetation had turned from green to jewel-like colours, that autumn too, perhaps, could be accused of being Baroque. the first of three autumnal hares to make an appearance here, was inspired by my passion for Baroque opera and also John Keats's poem "To Autumn". Mademoiselle Mellow Autumn is warmly dressed and cheery-natured. She revels in wandering through orchards, woodland, and gathering fruit and berries. She is also partial to sitting by the fire and sipping tea or hot chocolate which she ALWAYS drinks with tiny melted marshmallows. If you would like to see more details about her pop over here although I should whisper in your ear now that she has already GONE! I have knitted garments for her two friends from yarn called 'Homemade Jam', 'Embers', and 'Long Johns' for her friends. Aren't those splendid names for autumnal colours? They will be introducted to you shortly. Until then I really hope you haven't been too bored. I wish you ALL a beautfiul, tranquil weekend.